When it comes to transportation I am generally a typical girl. While my husband has an intense passion for one particular make, and can ooh and aah over its new models, I tend to think of them more as a means to an end. Of course, I don't especially care to ride around in a rust bucket, but typically, as long as they get me where I'm going not much else matters. Unless we are talking about the classics, those lovely old gems that have been given some TLC. You will spy them on a perfect sunny day cruising the highways, sitting outside drive-in restaurants on summer evenings or strutting their awesomeness at car shows, accompanied often by a soundtrack of music memories. To my mind these beauties outclass and outshine any expensive, sporty model that can be found on the market. 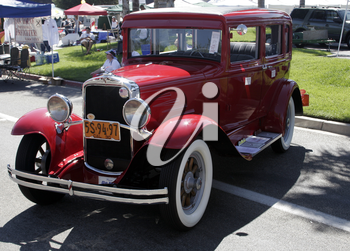 Whether it's a simple, but charming, Model T or a big old Lincoln Continental I love to look — but not touch of course. Show me some Mopar muscle and I'm positively over the moon. That's the fun thing about antique or classic cars. Even the least interested when asked, can come up with a favourite. It might be the big Packard their parents talked about, or the Buick in which the family were packed for Sunday afternoon tours. That is their magic — they stir feelings of nostalgia and return us to long ago places and lovely memories. Well, that and they look great too.